FREE Family Cycling Workshop – Bring your kids…Volunteers needed! Join Bike East Bay’s certified instructors and AS&R friends & neighbors for a day of fun games, safety drills, skills building, and a neighborhood ride. This workshop is for kids who are able to ride a bike and ready to take to the paths and roadways with their parents (suggested grade range 2nd-6th). The event includes instruction on fitting a helmet, performing a bike safety check, communicating with other road users, riding in a straight line and avoiding obstacles, as well as navigating safely through intersections, all while playing fun games! We will be debuting the new Youth Versions of our Check for Bikes clings and stickers so you can pick some up here!! We will also bring our bike teeter-totters and end the class with a group ride around the neighborhood together! All minors must be accompanied by an adult to participate, both with their own working bikes and helmets. Each child will receive a free reflective vest. AS&R will have an information table to talk to parents & kids about riding around the Albany area. 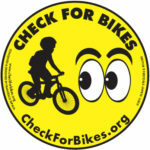 You can pick up some great “Check for Bikes” clings and bumper stickers, as well as reflective leg & arm bands for safer biking. The event is FREE but you must pre-register so for more information and to register please go here. WE NEED SOME VOLUNTEERS TO MAKE THIS A SUCCESS! We’re seeking 2-3 people to help out at the family cycling workshop. 9:30-10:15 to help with set up and checking in of participants, while instructors get a feel for the participants and check bikes out mechanically. 9:30-12:45 to speak to kids & parents about bike stuff, and help with packing up. Contact Britt at bthesen@gmail.com if you can help out!